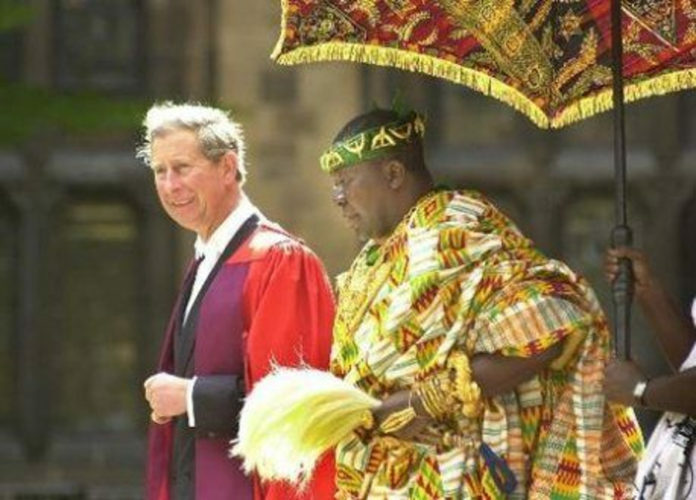 The Asantehene, Otumfuo Osei Tutu II, and his terrorist Lord, Prince Charles. The Commonwealth was born out of an inhumane contract with Ghana. Kwame Nkrumah became the first democratically elected political leader of the territory of Ghana in 1957 in a contract he signed with the barbaric British Empire, which was wounded and retreating, yet determined and unwilling to let-go of its former slave-colonies at the end of world war two. The Common Wealth of Nations was the neocolonial sham that took root in this retarded and violent night-soil left after that war. The nature of that contract alone destined Ghana for nothing but a neocolonial-slave existence. Worse, it turned Ghana in for undue turmoil. Ghana was never going anywhere to begin with! Nkrumah realized the misstep, attempted to correct it and met his instantaneous demise. Ghana’s first falter came at the hands of Nkrumah’s own intellectual and spiritual naivety—a naiveté that if you bear with me down a few more paragraphs, I shall explain. Nkrumah ruled from about 1954 until 1966, when he was summarily overthrown by a mercenary British Military general hewed from Anloga, Gen. Kotoka, who had himself hailed from a long line of Anlo Traditional State warriors from Alakple. (The Anlos are not to be confused with the incorrigible military Kingdom of Dahomey nor differentiated as such from Dahomey). The three-hundred-year regional military dominance of the Ewe-Fon through Dahomey and its satellite independent states of Anlo, Agave, etc., (now part of Ghana) is not to be ignored in this ensuing analysis. The Ewes, through their complex Confederate States together with the Kingdom of Dahomey defeated the mighty Oyo Kingdom to the east and they subdued to nothingness the only real threat of Asante to the west. There’s no doubt about the seriousness about war in a place where women (the Amazons of Dahomey) could be marshaled to finish off a battalion of British mercenaries. If one had to overthrow anything in Ghana as mighty and as formidable as Kwame Nkrumah was loved and cherished, one needed men from such a place, Ewe-Fon. Even their women (Mianor, or the Gbeto) were equally apt. Kotoka was not the first to attempt to end Nkrumah’s regime. In fact, many attempts had been made on the President’s life, several of which included actual bombings with real explosives, with actual casualties. However, another notable attempt on Nkrumah’s life came earlier, before Kotoka’s coup. Cpl. Ametefe, also an Eweman, botched a face-to-face assassination of Nkrumah. Rumour has it that Cpl. Ametefe was hired by the famous slave-trading family in Kumasi. Enter Kumasi. Instead of taking even greater precautions, Nkrumah grew even more naïve. Although Nkrumah understood at that moment the evil sentiments of the old slave trading family in Kumasi against his person, yet the man from Nzema, with no such warrior background as Kotoka and no such slave trading mischievousness to depend on for instincts, took no real revolutionary steps against this old cartel in his narrow-minded, single-handed fight for total liberation from colonial and neocolonial world powers in Africa. So it was no surprise that when he had adequately pissed off the Lords of Kumasi, the seat of the erstwhile Asante Kingdom, which had real interests in continuing in a bloody trade with the European terrorists (the British), that the fires of hell (coal and brimstone) were going to be marshaled against the Redeemer (Osagyefo Kwame Nkrumah). Again, who better to eradicate the obstacle than a soldier, a general, from a warrior state? Kotoka. Nkrumah then was overthrown by a serious British hired Anlo general from a serious military family, from a very serious military state. Kotoka became a general in the British Colonial Army (a terrorist outfit) of the slave territory that was the Gold Coast, fighting and defending the flag of pirates, the British. To be fair to Kotoka, he knew little about what he died defending. I doubt he was intelligent enough alone to decipher the cunning of the wicked organization of the Ayevu (the British). Still, it is against this backdrop that widespread rumors emerged. One notable story is that Kotoka was hired by the erstwhile notorious slave trading family in Kumasi to do its dirty biding against a rising star in the African liberation movement, Kwame Nkrumah. Nkrumah was outspoken about the European terrorism problem on the West African coasts, which had decimated African resources for more than three hundred years and counting. It well within this backdrop that the recent proclamation by the Asantehene, Otumfuo Osei Tutu II, that the Commonwealth is the “finest creation of modern history,” must be examined. The statement praising a terrorist imposition on the sovereign states of Ghana is true for this Asantehene as it was true for the Asantehene who partly hated and partly despised Kwame Nkrumah. Unpack what has been dubbed “the finest creation of modern history” and it turns out that even Kwame Nkrumah didn’t quite understand the new terms of the contract his government signed in 1957 with the British so much so that he wanted to annul it later. Nkrumah realized that an important mistake had been committed. The Commonwealth of Nations or the Commonwealth was not what he believed it to be. It was not to be confused with the Commonwealth of Independent States, which was the old Soviet rendition, however unnervingly awkward and terrifyingly similar, in its purpose and its posture. The terrorists, the Ayevu, the British, and their African puppets will continue to claim that the Commonwealth is an intergovernmental organization. But when it is examined, all fifty-three nations there were colonial territories of the former British Terrorism Cartel. Moreover, it is obvious deception that the cover organization for this British terrorism operates by intergovernmental consensus of the member states, including Ghana and Nigeria. Unpack the lie: First the Commonwealth dates back to the time of decolonization. The British Cartel that once unlawfully occupied our lands agreed that “increased” self-governance of its territories was the best route to managing the limitless resources they had to control by force in Africa and beyond. So the territories, one of which the terrorists called the Gold Coast (for its gold and human beings turned into chattel slaves), was constituted by the London Declaration of 1949. This declaration established the new state that is Ghana, first as a member state of the British Cartel, and second, as “free and equal.” This was Nkrumah’s nightmare and he intended to amend it. Our “freedom” is not without the irony. Nkrumah is reported to have asked: “Who in Walewale wanted first to tie her wealth to the commonwealth of the British, before her freedom and human equality were guaranteed?” More, when the priggish idea of “free and equal” is further examined under the scrutinizing eye of the symbol of this “free association,” who is Queen Elizabeth II, and who is the lifetime Head of the Commonwealth, unopposed, one is left with nothing warm and fuzzy left inside your bosom, but huge hairy pimples of cold chilling Neanderthal terror. Kotoka then must remove Kwame Nkrumah. And Kotoka did not only oblige to the demands of Kumasi alone. His very training in a terrorist army had demanded his ensuing foolishness. If he had actually trained in his traditional state of Alakple, there’s little doubt that he would have spearheaded such a monstrous removal of a fine, level headed leader as Kwame Nkrumah. So, from the Royal Houses of the slave trading stool of Asante, to Ho Motor Regiment in Eweland proper, Kotoka launched an irredeemable attack on Ghana’s aspirations for total liberation from terrorists. These terrorists wanted Ghana first as slaves of the British Cartel and second as “free and equal,” within the Commonwealth. A contradiction in terms. No matter how shortsighted, narrow-minded and egoistic Nkrumah may have envisioned our liberation from British terrorism on Ghanaian soil no place remains in Heaven for Kotoka and his enablers. Nkrumah was bitten by the blazing guns of Kotoka, followed in tow by Lt. Gen. Afrifa (like a monkey follows its owner) who was of the house of slave trading proper. It is also no surprise that the whole operation in 1966 was funded by the Americans who had proclaimed their “singular defeat” of Adolf Hitler (the Devil incarnate, proper). Now in 2018, the Yankees have secured the “singular rights” to build an ultra-modern military base in Ghana from none other than another Nkrumah hater, the president of the Republic of Ghana, whose father was a chief Nkrumah hater. The difference between a “singular defeat” and the “singular right” is lost only on the humble reader who may be fooled by words, and not the meanings behind the real actions of terrorists. Terrorists kill, often cold-blooded. Nkrumah himself, intellectually and Obamaly parading the streets of Hanoi like a celebrity, could only return to Ghana, his homeland, in a box, quiet, dead, rotten and frozen! Kumasi had won! The Commonwealth had won. Queen Elizadeath II had won. And most certainly the visit to Ghana by Prince Charles and the summary proclamation by the Asantehene that the Commonwealth is the “finest creation of modern history” cements the very idea that Ghanaians are first, slaves to the British Cartel, and second “free and equal” in a system headed by the lifetime king, or queen of England. The enormity of the charade of events then which led to Kwame Nkrumah’s fall and which simultaneously laid the first steps towards Ghana’s neocolonial-servitude to the West (particularly the United States of America especially in the twenty-first century) begun there in Kumasi, with help from Dahomey, and squares itself quite neatly and clandestinely on Anlo soil itself. One should not be moved or surprised to hear such words about the Commonwealth emanate from the lips of the seat of government of the erstwhile Asante Kingdom, which was ruled furiously by whomever sat on a stool made of actual gold, which had supposedly been charmed from the skies, but which in reality had been hewn from the ground by actual indentured servants. Recall also that the reputation of the Golden Stool was brought to it notorious heights by another mercenary military general/priest of some sorts, from Notsie, Dahomey proper. So the Asantes named him Komfo Anokye (or Notsie), for his ability to vanish in daylight. (But that too is another rumor). Recall that Kotoka’s Alakple was close to the seat of government of the Anlo State situated somewhere neatly between Asante and Dahomey. After the Era of Corruption (in which the terrorists, the Ayevu, had managed to convince some West African chiefs to sell them human beings in return for war machinery) Dahomey and Asante competed for the trade in human beings off the coast of West Africa. The terrorism of Europeans in West Africa had brought about complete and total corruption of our elites. And it is said that between them more than seventy-five percent of West Africans passed to the slave plantations of the Americas. This is why when the Asantehene in the twenty-first century proclaims that the Commonwealth is the “finest creation in modern history,” all Ghanaians should be terrified. All Ghanaians must be appalled. All Ghanaians should oppose the proclamation and demand from this Asantehene a swift apology to all Ghanaians! The Commonwealth is nothing but a terrorist outfit, an imposition on Ghanaians. There is something innately wrong in our psyche especially in our relationship with foreigners. I just cannot put my finger on it . The fact that our people still love foreign oppressors who kept them under the thumb,enslaved and dehumanized them , but hate their own who gave them freedom and liberation is intriguing . There is something really not right there psychologically . But what is the reason behind these warped thought processes of some of our own ? Corruption. All humans are capable of it. Brother… until we start learning History and Physics in Twi, Ewe, Mumpruli, Ga, Dagbani or some version of these… forget it. Is it not pronounced “Yevu” instead of “Ayevu”. Ayevu is the correct term. Yevu is a truncation. More correctly called a regionalism. Aye is trick, or cunning nature. So ayevu, or the orally shortened yevu is literally a cunning dog, though now the word just refers to any so-called white person, or Caucasian, with no derogatory connotations. There is nothing ethnocentric here. Are you saying this because Asantehene said it and Narmer Amenuti is critiquing. Please you are better than this ? Focus on the facts he raised to underpin his argument . Kwame Kyei-baffour please don’t bother. Garden variety tribalists thrive on arguments. This is their oxygen. Go on with your day and just ignore this. What our leaders don’t understand these days is this ? When they talk or express an opinion they need to understand that thanks to social media they are addressing a global audience of every Ghanaian who has an interest in the country . The fact is this, I would agree to what the Ashanti Chieftain said If only he had compared the commonwealth organisation relatively to let’s say Francophonie or the Lusophone countries organisation, the former portuguese colonies organisation , I am not sure why is called now …, and said the Commonwealth was the best of all these post colonial construct . I would agree 100 per cent . The fact of the matter is the commonwealth is not only a post colonial organisation but a neo colonialists one . That is true . Look our understanding of issues depending on education and experience is not at the same levels when one is addressing a global audience . says Every one has their ” Levels “! Including levels of understanding issues. There is nothing ethnocentric about what Narmer Amenuti posited . Kwame Kyei-baffour “veiled ethnocentrism”!? What is veiled about this. I am just pleased that we can now all this fellow fo who he is. History is told half correct and half wrong. It all depends on where our allegiances lie. But the Commonwealth isn’t only about Ghana, or African colonies of the British but includes other countries from different continents. Are they also as blind as we’ve been? I want to state this and make it clear, Commonwealth isn’t part of our problems, but ourselves. We have taken decisions for ourselves for over 60years without British interference but we’re where we’re now. Nkrumah didn’t want our resources to be spent on the British but saw nothing wrong in spending our resources on the Egyptians and other African countries, right? Whether Commonwealth or no Commonwealth, we take decisions for ourselves and that’s where we should worry about. Instead of holding onto a slave history that doesn’t change our living standard. Yes, slave trade wasn’t a good thing, but you really think there would be Ghana, with this system of government, without the coming of the British? My friend, you are also not entirely wrong, wai. Akofa Akofa, need I answer this? Are you questioning our sovereignty? Prince Wiredu Phinehas yes and yes. Akofa Akofa, well, what I can say, lastly, is that, the only threat to our independence is poverty, and not foreign governments. So instead of blaming foreign governments, we must look at how our people have governed us, in the last 60 years, bringing us into the situation we find ourselves, today. I don’t think the foreign governments put guns on the heads of our leaders to steal what should have been used to help our own people. I was taught, at the primary school, that if things aren’t going well as you expected, look to yourself first. Prince Wiredu Phinehas well said .but you still haven’t answered my question. AlkebulanVi Akofa Akofa, I have answered it. I said the only threat to our independence is poverty. When you’re poor, you go begging for help. And the people who help, do so with conditions attached. That’s it. Some of you, you say that the Slave trade wasn’t a good thing but with a smile. Eiy! Prince Wiredu Phinehas. Naa, Dade Afre Akufu. I didn’t say it with a smile. I just don’t want us to hold onto our dark past that much. It doesn’t help. We should think about how to move on and make life better for our people. That’s all I’m saying. The British coming wasn’t all good or bad. See, today, we have one Ghana. How could that have happened? Today, killing and some inhumane traditions are considered illegal. How could that have happened? Today, you and I are able to communicate with one language even though we may belong to different tribes. How could that have happened? So if Commonwealth isn’t going to take decisions for us, why do we hold onto that dark past and keep silent on the good that we have benefited from their coming into this country? All I am saying is that we shouldn’t continue say slavery was part of our dark past. No. It is also part of our dark present as dark goes. The kind of phrasing you engage in to dismiss three hundred years of slavery on these coasts is disheartening. It wasn’t a ten year war that must be overlooked to move forward. No. In order to move forward we must accept the direct consequences of slavery on our present. Dade Afre Akufu, then stop writing in English and using Facebook. They’re products of your slave masters. Dade Afre Akufu The commonwealth( just like the Ghanaian state) was a product of a resolve to extract something positive from the otherwise unpleasant history of colonialism( and not slavery as you suggest). Nkrumah so loved the project that he wanted South Africa to be part of it. Has the commonwealth achieved anything positive? It’s a question of perspectives; you cannot force yours upon our King. Question: how did the Asantehene hate and despise Nkrumah? Any factual evidence to substantiate this? Are you aware of Nkrumah’s transgressions against Asante and how even the Asantehene found himself leading the NLM against Nkrumah? It is also false that anybody in Asante sided with the British against Nkrumah supposedly because of some trade interests. The British colonialists rather allied with Nkrumah, right from 1951 till Independence, against Nkrumah’s opponents principally for economic reasons. At issue was the Cocoa industry and the CMB for that matter, and its significance to the British economy. The Marketing Board System of which the CMB was a prominent part had been instituted by the British in their colonies after the second world war mainly as a means of using forced savings from revenues from the cash crops marketed under the marketing Boards scheme to shore up the British economy which at the time was in tatters. The NLM’s opposition to the scheme and the monopsony enjoyed by the state to the benefit of Britain thus made them the enemy of the colonial masters(as some fools call them). Throughout the NLM’s challenge of Nkrumah therefore, Arden-Clarke and the entire colonial establishment coached Nkrumah on how to frustrate and eventually neutralize the opposition to his rule. If the NLM had won the 1956 elections, Britain would have been the major loser. It didn’t happen because Nkrumah won and maintained the CMB scheme and the cheap borrowing of our sterling reserves to the benefit of Britain. Please get the details from FITCH AND OPPENHEIMER’S GHANA: END OF AN ILLUSION. Nkrumah further rewarded the British for their support by actually increasing their stranglehold of our economy after INDEPENDENCE. There are too many fairy tales around Nkrumah and I find it a bit disappointing that an intellectual of your calibre are rehashing them towards the demonization of the Asantehene and Asantes for that matter. And trust me, brother, Kotoka was not the architect of the coup; neither was Britain the instigator of the putsch. We have so much to learn. I will post my piece on Nkrumah and South Africa on this thread. It will show you the lengths to which Nkrumah went to court the affection of the British. Too many fairy tales. The Asantehene’s take on the comment is right. It is a question of perspectives. For those who view everything from a racial perspective in which blacks and white are locked in eternal battle, he would be naive; for those who see humanity as not trapped and frozen in some past straitjacket, his message would be clear. Asantes and Fantes and many other ethnic groups in Ghana used to fight each other. Today we are brothers and sisters who share a common destiny. Why would one be wrong to consider the Commonwealth as a family of nations once at war with each other, but now united in the purpose and aim to make something positive of their past? I appreciate the fine detail. I would love to read about Nkrumah’s courting of the British, especially one at odds with his Pan-Africanist ideology with regards the CMB. Tag me. Me too I have been brought up in the many fairy tales of Nkrumah, which we must all talk about in public, else how to correct them? The nature of a Saviour, you would disagree that Nkrumah was one, is that he has lots of fairy tales. I can respect one who feels the way you do about the Asantehene’s statement. I feel differently. Obviously strongly differently. I carry my feelings in hyperbole, and that is obvious. It is a figure of speech. Although the charge that those of us who write from the perspective of race, as international issues go think blacks and whites are locked in eternal battle is not entirely correct. There’s some truth to it, but not entirely. I believe the plight of blacks in a capitalist world economy has something to do with race. But that is big subject. And so the Asantehene can both be wrong and correct, or none. His dalliance with the commonwealth is not all bad or all great. Time will tell. I wish his intentions the best for Ghanaians and Asantes in particular. But right now, I believe that statement is also rooted in hyperbole. “The finest creation of modern history”? Come on! But I get it, we come from the same place, the Asantehene and I. Hyperbole is our biggest weapon. When we launch it, things move. More when the Asantehene makes a statement like that he ought to understand that he brings out to the fore all the atrocities of the British in Africa for close discussion. Narmer Amenuti boos, Nkrumah was no PanAfricanist! Just rhetoric! Pure rhetoric! Kwame Kyei-baffour you forgot to ask about the date when the Ewe army defeated the Ashanti to nothingness😂😂😂. As I said above do not give them oxygen. Just go on with your day. Kwame Kyei-baffour, medaasi oo master. You I believe are a descendant of the native cocoa complex as well as a beneficiary of the age old Anlo-Asante alliance as myself. Our viewpoints, blindspots, ideological and historical lenses are just different. Your assertions that Nkrumah and the colonialists were in league is not supported by the record. The British perforce had to deal with him instead of their preffered interlocutors to wit “the independence in the shortest possible time gang” or the native classes that had most cooperated and benefited from the colonialists period. After the hybrid one man one vote/ electoral college election of 1951 was not designed to benefit the populist CPP! Neither was the 1956 election necessary or required, after all the CPP had just resoundingly won elections two years earlier. Was it not significant elements of the Opposition who petitioned for the Gold Coast to remain a colony including a stool eligible son of the Wenchi royal state? Kwame Kyei-baffour, Mr Armenuti was derelict, I will clarify: the renowned slave trading families of Anloga Nkranpong, Kumasi, Yagbum & Yendi, who in the main had become the collaborators and cooperators of the imperial capitalist system in the Gold Coast. Komla-Go Apaloo I shall be tagging the author in a follow-up post on this topic. LOL. So I hear oh Kwame. Kofi Kofi, there’s hyperbole there, but nothing clandestine or wrong. @Kwame Kyei-baffour: Isn’t it interesting that you who invoked elitism and intellectualism found it refreshing and convenient to quote Russell Warren Howe, a British Author and non pan-africanist in refuting Nkrumah’s claim on Pan Africanism? Thanks for the notification. I would make necessary upgrade. Meanwhile, don’t for once overestimate your depth. Neither do you need to respond. It’s you who made this personal and so don’t play any victim card. I asked you a very valid question about your sources of information and it’s accuracy with regards to the history of our country and all you did was to cast it aside as though it’s insignificant. But guess what, it isn’t and that’s what you got to deal with. In this instance, Russel warren Howe, who most people would have me to believe that is a truth teller and prolific novelist, didn’t find time in his entire literary life (magazines, newspaper and novels inclusive) to write about the hegemony of the imperial British american empires. Again he would like some of us to take his “romanticization” of Kissinger, aka the Edgar Hoover jr, as an critical novel/essay. But just as he claimed to have the training to see through the facade of lies, most people people see through him as well. The crux of my issue is very simple. Too little to be taken serious are the Europeans who have objective perspectives on places that aren’t occupied by Europeans. So while he [Russell] may have brought to the fore some relevant issues (which are of-course worthy of consideration), he lacked the moral and ethical authority to speak to the subject under discussion. Chai… these days the simple historical fact, well written and even accepted by Asante historians like Adu Boahen that Dahomey defeated Asante seff… that one too when you say it, hyperbole or not, you are ethnocentric? Ghana people paaa… You accept the British defeated Asante here and there, when that is the patently false claim. The British always used Ghanaian armies. One day I am sure that even the Katamanso war will be called a win for Asante. Or even, a win for England, not the Ga Adangbe! What is more ethnocentric? History is told half correct and half wrong and, usually, based on where your allegiances lie. Your understanding of history is pathetic. To you, if the British lead a local tribe to fight Asante, it’s the local tribe that’s won and not the British? Do you know the number of countries that were used to fight world war II, and under whom they fought? Seeing that you understand so much history, why don’t you go ahead and teach about world war II, and under whom the enslaved peoples of Africa fought under against their fellow Nazis? A traumatized, or chief who can’t even tell what is fantasy and what is reality. Chaaiii! An excellent summary of the past. I agree with Narmer on this rendition of our history. I just do not accept your criticism of Nkrumah’s modus operandi in dealing with Kumasi. 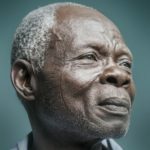 I am a Kumasiano. I am a Kurofrom/Ash-Town/Suame boy. I attended Prempeh College and KNUST. I know what I have seen, read and heard. Nkrumah appreciated the fact that both Kumasi and Anlo were VICTIMS in a well-engineered barbarian pirating scheme by certain interests from Britain and elsewhere who did not necessarily represent the British Nation as a whole. I have mates and colleagues from college who even till this day have not shed their Master/Slave indoctrination. One can only empathise with such. NURTURE is a super-powerful mind-engineering weapon. Nkrumah could only ENDURE the Exodus period, until a new generation could be cultivated whose minds had not been infected with the Slaver/Slave virus. I treat all the players in our national struggle as VICTIMS. What we should be doing now is to spread the light. Every country has its nation of Slavers. When such align to execute their ideologies, the nations of Free-Men from these countries should also align to enforce The Liberty. Yesterday’s Slavers can become today’s soldiers of liberty — if they SEE and ACCEPT the light. The enemy is our IGNORANCE of the machinations of evil everywhere. Evil is not a flag, a country or a race. Evil is a nation of like-minded sloths who will not subdue the earth for a living but would rather subdue fellow man. May our obsession be about crafting a better FUTURE, while being guided (not guarded) by the past. Many are mental. Few are roaming. Slavery is a symptom of MENTAL HEALTH DISORDERS in High Places. Nice to see an Ashtown boy not crying ethnocentrism about history no matter how hyperbolic some may claim it has been used here to paint the picture of the commonwealth and the asantehene. History is not ethnocentric. Narmer I am confident you wouldn’t fall for Kwame Kyei-baffour’s usual blackmail. Dem say de native cocoa complex was not in league and hock wit de imperialists!! Ebei whaan nu dwane kor London so ” your job here is not done”, abi who dey collet 💰 from waAmeriki circa 1954 onward. I laff sef. Narmer has his own way of interpreting issues. This piece made interesting reading, though it’s difficult to agree with all the details here. Surely, Ghana and Britain need to remain close partners, despite the somehow ugly past between a former colony and her metropolis. Britain itself had been colonized by the Romans and others, partly tracing in turn some inspiration from Egypt of the pharaohs. Diplomacy requires a different approach than one employs in academia or polemics. The British denigrated the Chinese also but are now very good partners, though the wise Chinese probably haven’t forgotten that semi-colonial past. Let’s move forward with old and new partners for the sake of mother Ghana. To understand the slave trade, you need to reference the Bible because it is the history book of the sons of Jacob (Hebrews) which includes the Ewes, Gas, Adangbes, Yorubas and Igbos. They were sold into slavery ‘mostly’ by those who were not. You can think of the Akans, Hausas and the Fulanis. That explains the Ashantihene’s statement. The Chinese too were colonized by neighbors Japan. Norway too by Sweden, and the list can be endless. It is difficult to tell how the same line of complete subjugation of Ghana to the Commonwealth, that is to the Queen of England, emerges in China’s relationship to the west, to the USA and to Japan. Relationships like marriages must begin on equal footing. Even for nation states too! Else, call it what you wish, but it is abuse. This, to me is Narmer’s point. “The commonwealth [of which the Queen of England is the unelected head] is the finest creation of modern history?” You can’t be serious! Has Japan said any such thing about the US? Has the Imperial throne of Japan said any such thing about any institution proposed or imposed by the Russians? Have the Germans said any such thing about the US or the Soviets? Has Norway said any such thing about Sweden? No. Ours, our African relations with the west, has always begun with one of abuse, not necessarily of the puppets that be, but of the very people we purport to love. What is so wrong with admonishing leaders to rise to the occasion and present us to the world as equals? Equals not in language and prose, but in practice. What is so wrong with that? Melvin Yeboah Odoom since you dont have the facts, can you point the areas you think lack objectivity? Kwame Kyei-baffour, Massa I beg tag me as well. Thank you. Kwame Kyei-baffour, I am open to adversarial viewpoints, so long as inferences and deductions are based on the available historical record. I remind you I am a descendant of the native cocoa complex as well as a beneficiary of the age old alliance. I am well steeped in the history of the rump UGCC, Ghana Congress, GaShifimoKpee, Anlo Youth Association, Togoland Congress, Northern People’s Party, National Liberation Movement et al. This piece is food for thought and requires deep analysis. A leopard never changes its spots. Why are not the Prime Minister and his colleagues desirous of taking a decision here to liberate ourselves instead of going all the way to London to beg for liberation?? I HAVE LOOKED QUITE CAREFULLY INTO THE WHITE PAPER AND WHAT APPEARS TO HAVE HAPPENED IS THAT THE GOVERNMENT SEEMS TO BE UNDER THE IMPRESSION THAT WE OF THE GOLD COAST ARE NOT YET FIT FOR SELF-GOVERNMENT; (SOME HONORABLE MEMBERS: NO!) THAT IN FACT WE NEED A FURTHER PREPARATION BEFORE WE CAN TAKE CONTROL OF OUR OWN COUNTRY. That must be the case otherwise our Government would not have thought of a necessary transitional period for making constitutional and administrative arrangements for independence. THAT MUST BE THE CASE OTHERWISE OUR GOVERNMENT WOULD NOT CONSIDER IT A MATTER OF URGENCY TO REMOVE THE SUBJECT OF DEFENCE AND EXTERNAL AFFAIRS FROM THE DIRECT CONTROL OF THE CABINET AND HAND THAT SUBJECT OVER TO THE GOVERNOR ALONE? THAT MUST BE THE CASE OTHERWISE THE GOVERNMENT WOULD NOT HAVE VEST THE CONTROL OF THE PUBLIC SERVICE OF THE GOLD COAST IN THE GOVERNOR WITHIN HIS OWN DISCRETION. That must be the case otherwise the Government would not have vest the control of the Public Service of the Gold Coast in the governor within his own discretion. That must be the case otherwise our Government would not say that no request should be put forward for the removal of the Reserve Powers. It is our view, Mr. Speaker, that the proposals for the interim changes in the constitution are a trick to keep us away from immediate self-government. Then we have just one other matter as regards the detail upon which I would like to touch. I refer to the question of [a] a second Chamber. In the Memorandum in the White Paper ALL THE PRINCIPAL PARTIES (caps mine) who wrote asked for a second Chamber – except the C.P.P- and of all the 131 groups which sent memoranda seven, the C.P.P and *six other bodies did not ask for a second Chamber. The Asanteman Council did so deliberately and in writing; the Joint Provincial Council did the same . WE HAVE NOT CHANGED OUR VIEWS AND WE STILL STAND FIRM BY THAT VIEW THAT IF THIS COUNTRY, IF IT IS TO BE SAVED FROM A HASTY LEGISLATION AND FROM DICTATORSHIP, WE MUST HAVE A SECOND CHAMBER! (Excerpts of one of J.B. Danquah’ s speeches during the Legislative Assembly Debate -10 to 15 July,1953). FROM G.E. Metcalfe’s GREAT BRITAIN AND GHANA ,Documents of Ghana History 1807-1957,pages 719-20. Kwame Kyei-baffour, when you say I “cannot force” my opinions “upon our king [the Asanthene]” I am not exactly sure what you mean. I don’t think anyone here is really trying to change the Asantehene’s mind. Far from it, we know he doesn’t change. We know he doesn’t listen to anyone else but the midnight voices of the Golden Stool. More, you are correct that he is your king. We all have our own kings you know? None of whom I respect. None of whom I pay any allegiance to. My allegiance, no matter how fraught, now lies in the republic that is Ghana. Not with the president either! Now, I understand your allegiance may lie somewhere else (don’t quote me on that, I don’t know). It’s your choice, that too, I think, our constitution allows. However, it seems to me that you claim two things in the same breathe: (1) that the commonwealth was not a good thing, that Nkrumah wanted it, but Danquah opposed it in July of 1953 (here Danquah speaks for the Asante Council, for the Asantehene?) and (2) that now the Asantehene has come around to liking the Commonwealth so much that what he describes as “the finest creation in modern history,” seems to me, an approval in hindsight of Nkrumah’s genius? Does it not – especially if you claim the Asantehene speaks for all Asanteman, past and present? Again, this is the view of your king alright. I respect it, but I totally disagree with it. I think the Asantehene misspoke. I think he is trying to please Prince Charles – a man, who I believe is not worth pleasing. Why? Prince Charles is a vile man. A human being he is, but a vile, notorious, inhumane man he is. He is a terrorist, and he is married to the bloodthirsty, blood-drinking Queen of England, Queen Elizadeath. It is only upon this view that I disagree with your king. Else, I hold no grudges against your king, man!